Considered by many to be the greatest single book of Marian spirituality ever written, True Devotion to Mary is St Louis de Montfort's classic statement on the spiritual way to Jesus Christ though the Blessed Virgin Mary. Beloved by countless souls, this book sums up the entire Christian life, showing a way of holiness that is short, easy, secure, and perfect way of life chosen by Our Lord Himself. 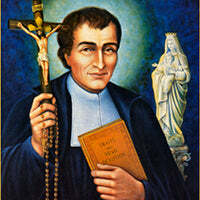 Saint Louis-Marie Grignion de Montfort (31 January 1673 - 28 April 1716) was a French Roman Catholic priest and Confessor. He was known in his time as a preacher and was made a missionary apostolic by Pope Clement XI. As well as preaching, Montfort found time to write a number of books which went on to become classic Catholic titles and influenced several popes. Montfort is known for his particular devotion to the Blessed Virgin Mary and the practice of praying the Rosary. Montfort is considered as one of the early writers in the field of Mariology. His most notable works regarding Marian devotions are contained in The Secret of Mary and the True Devotion to Mary. The Roman Catholic Church, under the pontificate of Pope Pius XII canonized Montfort on July 20, 1947. I bought this as a gift for a friend, who gratefully received it. I have also read it myself. I strongly endorse this book, which is available unsigned by the author. We bought this book from a seller years back before we knew about Tumblar House, but still, I had to review it because it is that good. I just completed it. I have done Louis's 33 days before and wish I had read this first. It is so very good. Read the main text before doing 33 day preparation if you have time. But if you don't have time, just jump into the consecration prep at the end. Don't delay! Also contains tips for the rosary. I should've read this book a long time ago. It certainly lived up to its reputation as THE book on Mary by THE greatest Marian saint. The book is very thorough and has plenty of insights on the role of Mary, and how we can practice devotions to her. De Montfort says that God purposefully hid Mary from the world for a long long time time, largely because He didn't want people to confuse her as a deity. Humility is one of Mary's defining qualities, although it is so often overlooked. After reading the book, I realize that we have certain special advantages related to Mary that early Christians did not, for example, the Rosary. And we need to take advantage of the special graces that are available to us through Mary. We surely will need them to combat the new challenges of modern times.